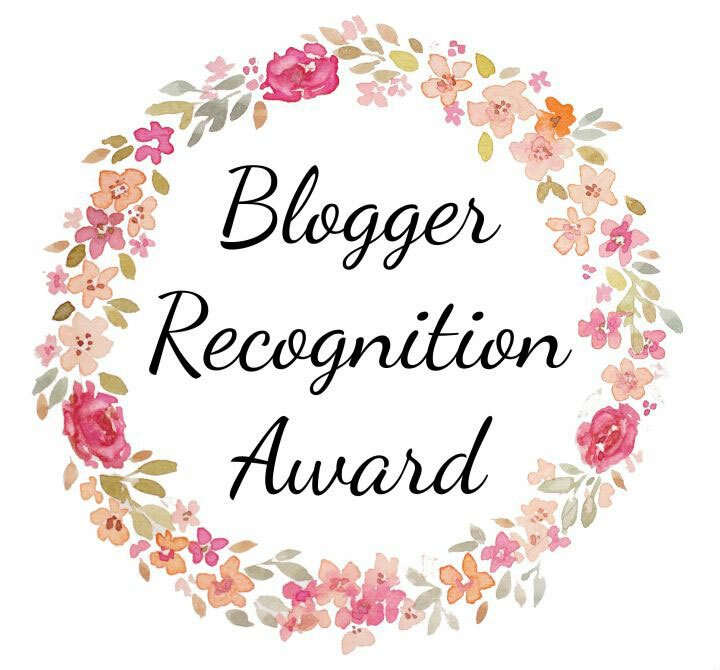 Thankful Thursday: Not For New Toy! ...without a cat anywhere nearby! Someone thought a new type of toy would bring out the kitten in Angel and Chuck. That person was full of glee when the toy was sniffed, and the scratchy pad in the middle was scratched. But no cat touched the ball, and it's been sitting silently on the floor since that first 30 seconds of cat inquisitiveness. Someone feels crestfallen. And yet, I am thankful for my kitties, because they don't think like I do, and they teach me to eat when I'm hungry, sleep when tired, meow at the trash collectors, and purr when things feel SO GOOD! Labels: Angel, Brian's Home Blog Hop, Chucky, New Unused Toy, Someone should have learned this lesson by now! Folks, I cannot make this stuff up! While traveling around on lunch break in the nearby subdivision, aiming at the local park to sit and enjoy some Mother Nature, I spied a grey tabby cat casually strolling down the sidewalk. My "Oh no, a stray cat!" instinct immediately kicked in, and I pulled The Cat Car over to the curb and parked. I oh-so-casually exited my car, (phone in hand!) and called, "Kitty! Kitty! Kitty!" And the cat walked straight up to me, purring away, and allowed scritches and pets. "Wow!" I thought to myself, "what a cat whisperer I am!" The stray cat then jumped up on my car...then up on the roof! I was gobsmacked, but managed to snap a few photos. Then, I'm thinking...what am I supposed to do? If this stray cat needs a home, do I just open the car door? While I wrestled with this for a moment, a man from across the street called over and told me, "that cat belongs to the house over there!" as he pointed. I thanked him, and when I'd turned around again, Not-Stray-Cat (NSC) had jumped down and continued his stroll, in the same direction he first was headed in. He was obviously walking home. 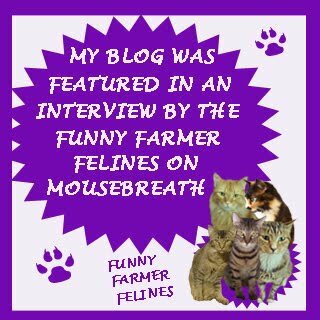 Not so much a cat whisperer, rather more a cat NOTICER! Stepping alongside, I spoke softly to NSC, and he stopped to give himself a quick bath in the middle of the sidewalk. Thankfully, NSC isn't in need of assistance, but I am beginning to wonder if I 'attract' cats from out of the blue. Anyone else have the same thing happen to them? While on vacation, on a walk in the neighborhood, visiting my mother's senior condominium complex...I find cats. for Angel and Chuck's Gotcha Day! of food for him when he asks for some. Angel and Chucky's 13th Gotcha Day! 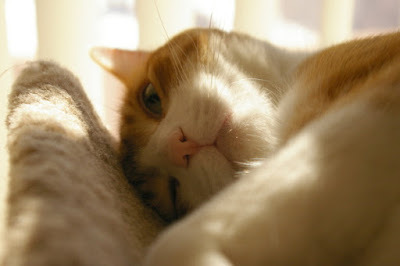 Thirteen years ago, The Hubby and I drove out and came back with two kittens in a box! The black and white kitten climbed the driver's seat and perched on The Hubby's shoulder, while the dark brown kitten stayed inside the box on my lap in the back seat. We are first-time cat parents, and boy oh boy, have we learned a lot along the way! In her favorite napping spot, perfectly furred to her liking! This is Chucky, a few days ago after he'd been given a dose of the appetite stimulant mirtazapine. Only AFTER we'd given it to him, did I read that it can cause increased vocalization! It's really a form of speed! He kept on like this for almost two days; thankfully he's quieted down now, but we never really saw much of an increase in his appetite. We'll continue to work with yummy flavors and give him fresh food anytime he asks for it. We've all lost furbabies, either our own or one that was like your best friend, even if it was a neighbor's cat or your grandparent's old dog. The Chronicles of Zee and Zoey began RBRD in honor of their beloved kitty, who left this Earth three years ago. 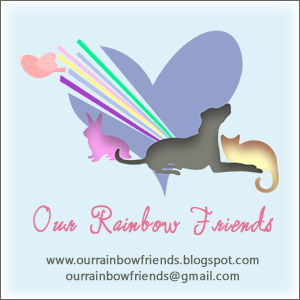 Although a somewhat sad day, we also remember the joy, laughter, and love of our furangels. This has been exceptionally hard for me, since our Chucky is beginning to fail. I don't want to leave the house, for fear of losing even a few minutes of time with him. We hope to have many more months with him, but it won't be years. Knowing what is on our horizon, makes RBRD difficult in reverse. Angel Sammy was a friendly feral, who I helped over The Rainbow Bridge when it was apparent that he was very sick. Took me months to stop looking out the window for him. Rest In Peace, Sammy. William, from William of Mass Destruction, was very important to me. His stories made me think I could write online too! I miss this kitty, and his brother Russell, who left us much too soon. 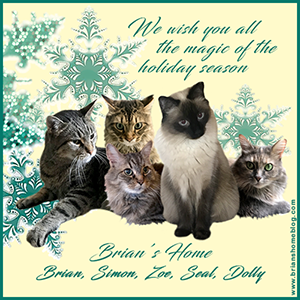 There are many other friend's kitties who've passed, that make me sad; too many to list here. 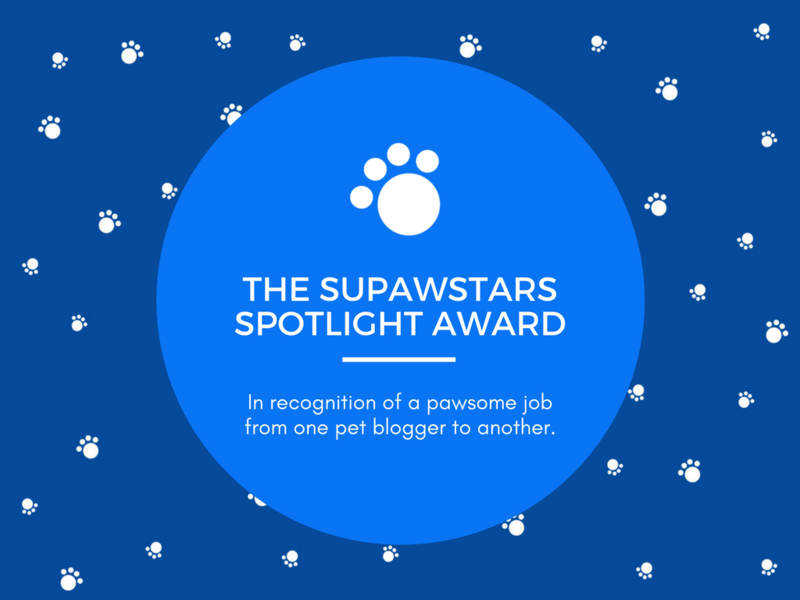 Each blogger has mentioned their own angel furbabies. I'll add Angel Goose to my remembrance post; he was a wee kitten but was very sick. His human parents moved away after he was helped to The Rainbow Bridge, but they still mourn his little soul. And George, my very first feral/community cat, who I found at my previous office in 2008. When I finally trapped him, and delivered him to his furrever home, I felt hollowed out and sad. No more sharing tuna sandwiches with George on my lunch hour, or visiting with him while nearby deer roamed the woods. George's family became fast friends of mine, so they let me know when he was helped to The Rainbow Bridge to end his suffering. I learned so much from my 'George' experiences; he's really the one who set me on my path of recording my life with cats. Rest In Peace, Angel George. Someone Has Too Much Free Time On Their Hands! But seriously, aren't these adorable? Angel is a good sport! away like his tail was on fire! ...I did it to myself too! Labels: Angel, Hello Kitty, Snapchat, This is all your fault NY! 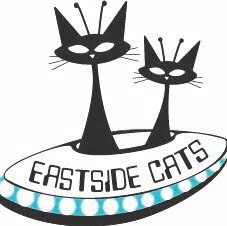 Phoebe's Traveling Shades Arrives at Eastside Cats! a bloody stump, go ahead!" 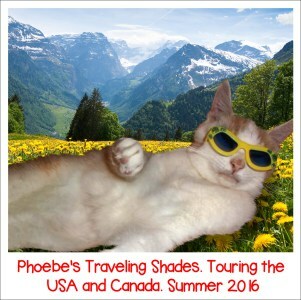 Yes, Phoebe's Traveling Shades finally arrived, and a great time was had by all! Well...okay...Angel sorta enjoyed it, and Patty O'Malley was thrilled to be included....because The Hubby was giving him pets and lovin'! Ever onward and upward, Phoebe's Traveling Shades are on their way to the next victims household. Thank you for the catnip toy, 15 And Meowing, and it's a thrill to have in my hand something that Phoebe once modeled! My niece sent photos of her new kitten, Toby. She says she calls him 'Baby' mostly, and I can see why. What a cutie! Angel has the image of a full solar eclipse in her fur! Angel says, "Mama, I think you are crazy!" When I get a couple of minutes to breathe, I've found that working online jigsaw puzzles is a great stress reliever. All because of Colehaus Cats! Every once in awhile, Colehaus Cats posts a custom puzzle made from their own photos, and I have gotten hooked on those images. Of course, I like jigsaw puzzles with a kitty in it, or a famous work of art. Sometimes, there are beautiful photographs of birds, or lions, or a water buffalo! 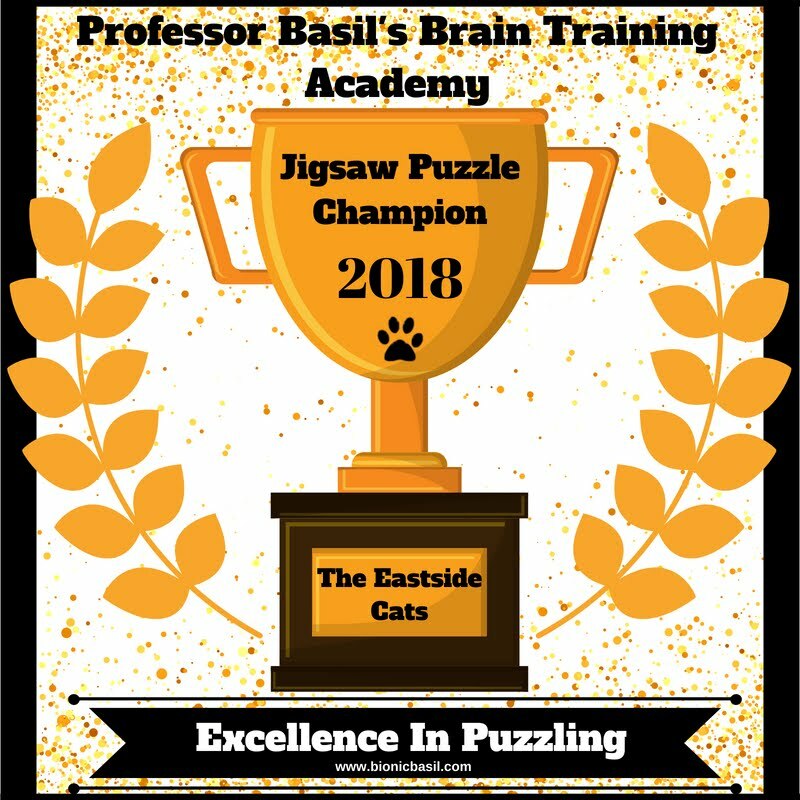 You can change how many pieces your puzzle will have, or the style of the jigsaw, and there is a timer so you can have a competition. But I simply like testing my skills as a way to 'zone out' for 10 or 15 minutes at a time. Of course I honor Chucky, our resident black cat, for today's Black Cat Appreciation Day. ...Use a photo taken last week! 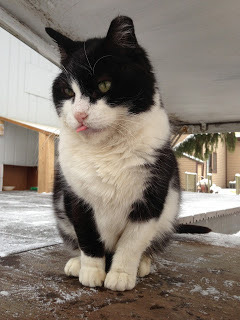 Of course, we mustn't forget our friendly feral, Sweetie! 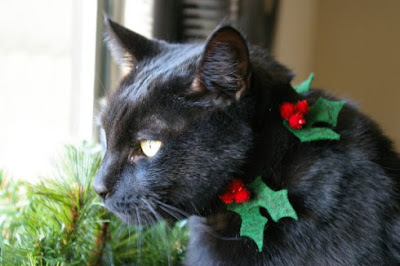 Black furred cats are so silky, so gorgeous! Everyone ought to get one of their own, methinks. Yes? Sneakers, putting it out there! Has that new book smell! Close Up of Hula Cat! I started reading The Joey Grey Mysteries in 2009, when I discovered the series while kicking around the public library. Went out and purchased every book already published, and read them in order. Now as new books appear, I drive to the bookstore and buy! Yes, they are cheaper if pre-ordered, but the act of picking it off the shelf is now a thrill that I relish. A routine, if you will...and we all know how much cats LOVE routine! Shhh...don't tell The Hubby; he thinks I only pick up books at the resale shops. So, I played with my Prisma app, and love the result! My dear friend CD gifted me with these sweet cat socks! Aren't they the cutest?!? Thanks again, CD! I love that they are shorty socks; purr-fect to wear in the summertime. Every Cat Wants To Be An Island...Alpaca!